Model MT550IC Minnie model Mackissic brand walk behind roto-tiller with 5.0 Briggs and Stratton engine. 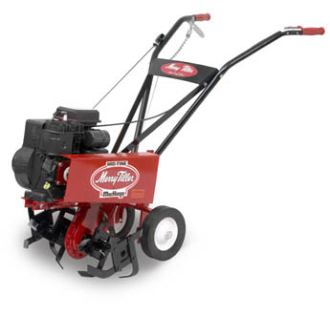 Model MT550IC: Minnie Tiller model with Briggs And Stratton 5.0 hp engine with recoil start, has roller chain and sprocket type transmission, has maximum tilling depth of 8 inches and tilling width of 18 inches, comes standard with slasher style tines, wt. is 95 lbs., unit ships by truck.